The cultural history of a parish is not a simple “telling of the story” because there are, in fact, many stories. The value of a parish cultural history, like individual, family, and other institutional histories, depends on where you begin, what you include, and what you don’t include. “The story” is often assumed to be a seamless tale that reveals and accurately reflects the truth. More accurately, however, in contemporary story telling, the story is neither homogenous nor accurate but a series of fragments of stories that disclose the complexity, depth, and messiness of any human narrative. That being said, Saint Maria Goretti Parish is a continuing story of a conversation with God and God’s Word and this community that struggles to be faithful. Jesus Christ is always encountered in a particular time and place. The conversation began with intention in a time and place when Father Richard Ameling began in early 1977 to talk with Catholics in the Dyer-Schererville area. A local church, a Catholic parish, came into being and was soon identified with geography and bounded, becoming a “place.” A building was built, and that building was dedicated on December 20, 1981. The dedicated building, consecrated with the Sacred Chrism, became the gathering place for the local Catholic people. The building and surrounding property was called Saint Maria Goretti Parish (the naming would be a story in itself). Father Ameling tried to form this faith community through listening to the Word and celebrating Mass. The early celebrations of the Mass in the neighborhood public schools had a significant influence in the forming of this faith community that can’t be overestimated because everyone had a part in the liturgy. It is important to note that the Mass itself was being significantly altered as this parish was beginning its “story”. The symbolic language of the Mass, both spoken and unspoken, was in the process of a radical change. Father Ameling and the young and growing Catholic community could not have imagined the consequences of that change at that time. This sacred place, the church building became a home for people not related by blood but by faith. They held much in common and, in fact, had much in common. They called themselves a family. They were almost all of European ancestry but had already, for all practical purposes, lost the connection between their particular European experience that provided the link between the Catholic faith and their celebration of that faith. Even still, they found a degree of intimacy that joined them to one another and the Church, this church building, specifically. However, even as this “family” was celebrating the Dedication of the Church on that December day in 1981, the very notion of community, not to mention family, was being challenged. Dyer, Schererville, Highland, Munster, and Saint John blurred their borders with large influxes of “outsiders” moving south from East Chicago, Hammond, and Whiting, even, Munster and Highland people were coming south. People living on the South Side of Chicago and in the south suburbs in response to real and perceived social, racial, and economic change began to move in substantial numbers to the Saint Maria Goretti area. This migration will likely continue in increasing numbers for the foreseeable future. In the spring of 2004, Saint Maria Goretti Parish has 20% of 1200 families belonging 9-27 years, 20% belonging for less than 2 years, and 40% or registered parishioners belonging 2-9 years. In all of this movement, today, the people who claim the parish have become accustomed to the absence of a common sense of space and the lack of a community center. Saint Maria Goretti Church has become another building. Like Meijer or Wal Mart or Jewel or Borders, it is another destination lacking any particular sacred dimension, another place among other places. It is dramatically obvious at the weekend Masses, that this is not even a “place” for young people. Their absence is deafening. A conversation has not been developed or maintained with them after their elementary experience with Catholic religious education, school or CFP, and these young (19-45) people are probably lost to the parish and an appreciation of the wisdom of the Catholic faith, not to mention the practice of the Catholic faith. Among the largest group of people moving into the parish in the last ten years, perhaps not so surprisingly, are so called, “senior citizens” and “empty nesters.” They experience on many levels a sense of loss and the accompanying grief. They have left homes and home parishes, neighbors and neighborhoods, all the familiar places that gave meaning and direction to their lives that they took for granted, and come to an area without traditional community creating “places.” They have no corner taverns, grocery stores, no convenient parks, no sense of neighborhood, and nowhere to walk. The most serious loss, as far as their Catholic faith is concerned for them, is the loss of a place that holds sacred memories, i.e. the place where they were baptized, made their First Communion, got married, and buried their parents and grandparents. Saint Maria Goretti is a church, not their church. They maintain the practice of the Catholic faith and generally attend Mass with regularity, but find no sense of belonging to this community. To witness the reality of this strange and detached faith practice, one only need attend Mass on any given Saturday evening. 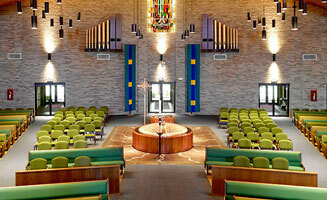 Many people begin gathering an hour or more before Mass, sit in the same place every week, and develop a sort of “neighborhood.” The exodus of large numbers of people before the Mass ends is troubling and sad because it indicates the absence of the sense of belonging to a community so necessary to a Catholic parish. Movement and mobility, traffic and time, are central daily issues. People are increasingly accustomed to “being somewhere” with time a very limited reality of their daily and weekly life. At the end of the week there is very little, if any time allocated to communal worship, Mass. In reality, there is very little time available for any leisure activity. A sense of self-containment and self-reliance has been introduced into family life as families find themselves living further and further from their homes of origin. “Home” has become an ambiguous term, but more or less, temporary. The Internet, the fax, and cellular phones have had a profound effect on the value and manner of human communication. Catholic Mass requires personal presence and time to cultivate a sense of the personal in the details of life. Both of these are seriously lacking in the experience of the people of this parish and without a creative, imaginative response, it is likely that in the very near future there will begin a dramatic decline in Sunday Mass attendance and participation in any kind of parish life. It is not at all clear what is held in common by the people who claim this parish today. It is not at all clear what we have in common. The parish is still overwhelmingly of European origin with the emergence of a small Latino and Asian membership. The notion of a parish being a “family” in the sense understood by the founding members is no longer operative and probably not possible, if desirable. We will wait and see what happens next.